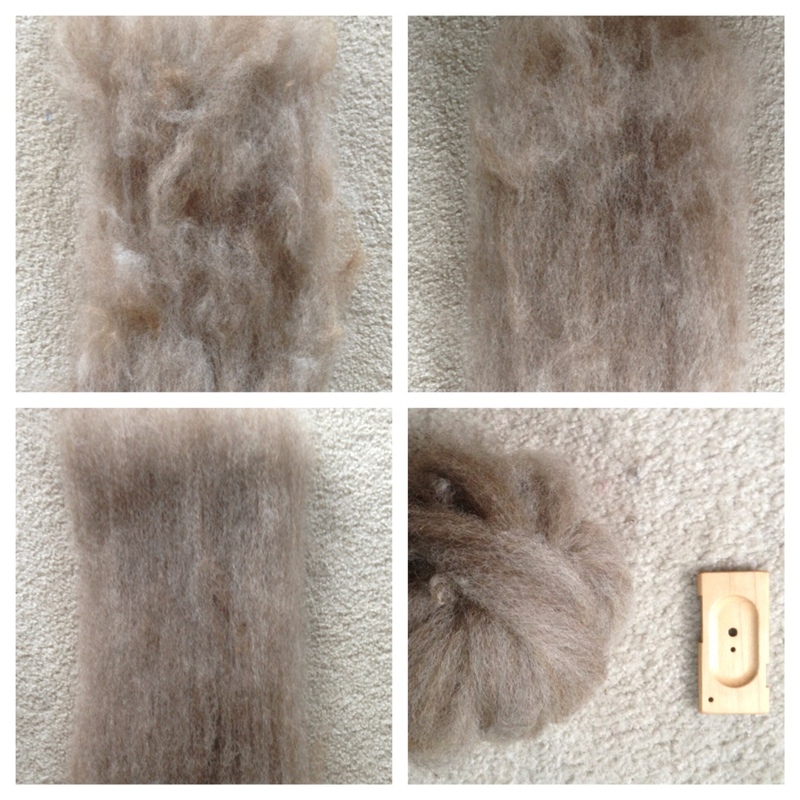 I have been wanting to write this post for a while, because when I first started processing fleece, I looked for “raw fleece processing posts for dummies” post and didn’t come up with one that walked me through getting the wool, washing it correctly, not maiming myself on the drum carder (no, I don’t have a cat), and how amazing it is to spin from sliver. So here we are. I’m posting this with a wikki type approach–please feel free to add comments and suggestions below, because I’m still learning. And..I want to document this while the “d’oh” moments are still really fresh. Hope it helps someone at some point! 1. Washing. Lanolin can be one tough bugger. When people say the water should be over 140 degrees, they mean it. Living in a 2 bedroom condo means I can’t take over the kitchen, bathroom, and I don’t have a back yard. So, I process small batches at a time. The washing machine doesn’t work for me because our house water temp is not high enough and I don’t want to risk scalding myself at another time. 🙂 I wash bags of fleece in a netted lingerie bag in the kitchen sink–at weights ranging from 8-10 ounces, depending on the fleece. Yep, it takes me a while to wash a fleece..but it takes me a while to spin it too..so no need to rush. I learned after a few failed attempts that I need to fill the sink with hot tap water AND add two pots of boiling water to get it hot enough to melt the lanolin. Usually it takes two rinses with Dawn, one with a tiny bit of vinegar, and one plain hot water. This has worked out beautifully..no more sticky fleece. The dead giveaway was when I tried to spin some fiber off my drop spindle and I couldn’t draft it…the wheel will pull the wool out of your hands..but a spindle? Not so much. 2. Carding. I LOVE my drum carder. I love carding wool. I have NO regrets from this purchase. I bought a new Brother for about $300. It does not have a packer brush, which is an essential item, IMHO, so I use a hard bristle brush with my left hand while I crank with my right. I also learned that carding takes a certain rhythm. The first time, I was so excited I plopped the wool on without opening it and loosening it, cranked and had both drums on the carder totally covered in wool. Then I learned a few tips. Small chunks of wool, locks opened up, and crank slowly at first. I card an ounce at a time and always do three passes. You can see from the photo above how much it evens out after each pass. I also consider the first pass to be more of a combing things into a certain order, so I open the locks, but I don’t lay them all flat, etc. 3. The DIZ..what a great invention!!! (Or use a large button with a decent size hole). I finish an ounce of fiber, and pull it through the diz to make sliver. When I spin, there’s no drafting, it comes straight off the ball, and my spinning time is cut down by about 25% from when I draft from commercial roving. This has also given me the chance to really work on my long draw, which is so relaxing now. So there you have it. Intro thoughts on fleece processing in a very limited environment. This has been a game changer of a learning process for me, and honestly…now I don’t even look at commercial roving unless it’s a specialty item. Raw fleece is like an empty canvas..and it’s a beautiful thing. Thoughts from others who have tried this? Ideas to add? This entry was posted in Fleece Processing, knitting, Spinning, Yarn as art and tagged drum carder, fleece processing, handspun, knitting, raw fleece, Spinning by Leah. Bookmark the permalink. I am terrified to start spinning! The fiber was given to me by a fellow blogger/knitter/spinner and I just don’t want to muck it up! I’ve watched videos on YouTube, read books and stared at the fiber in abject terror! Do you have a spindle? Just have fun with it, knowing that your first yarn will be something to treasure and smile at..and it only gets better from there. There was no YouTube when I started..such a great tutorial. Also, craftsy has some good courses! I have a drop spindle, that’s what it’s called right? I just don’t want to ruin something that someone gave me out of sincere kindness – I feel I owe it to her to create something amazing! Yes, drop spindle! Maybe try getting some cheap “learning fiber?” Then use the good stuff when you feel more comfortable. Also..start with a “park and draft” approach. Search that term..it will help you immensely and take the pressure off! Oh thank you, any advice I can get is SOO appreciated! Would it be a bother if I asked for advice now and again? This is something I have always wanted to do and I would like to be able to do it well. Thank you for this post! Very informative! You’re welcome!! I’m sure I will keep adding to the “lessons learned! !” Glad it was helpful! Sounds like a completely different language! Hahaha! Totally!!! I have decided that this is part of the creative process..not work to get to the creative part, but yeah..tons of new stuff to learn!! I agree. It has to be part of the creative process as without this bit you can’t do the rest. Thanks for the information. I also have to wash in small batches and just got some raw fleece with lots of lanolin. Will try adding the boiling water to up my water temp if I persevere with it. It has a LOT of vegetable matter. You give me hope! Glad it helped! I ended up using a cooking thermometer to make sure it was hot enough but not too hot. I was surprised that my tap water was only 120 degrees! Hope yours turns out well!! A newbie spinner myself, I’m always glad to see someone post their experiments. I have plans to learn to wash fleece tomorrow with a couple of spinning friends. My first attempt at spinning was with a drop spindle. I’ve left it in the box, so I don’t try to frog it and start over. I have taken yarn that didn’t have enough twist and re-carded it. It came out a lovely soft rolag that was a joy to re-spin. I’ve used 3 different drop spindles, a kick spindle and a spinning wheel. The kick spindle was my favorite until I fell in love with this wheel. Spinning is so relaxing, even ‘park and draft’ on a drop spindle has a certain rythmn to it that is soothing to stressed-out nerves. Don’t over-think it, just get in there and try. Hi Leah, I have my raw fleece but do I worry about the vegetable matter in it before I wash it or do I just comb the wool after it’s washed and dry to get the veg matter out? I have the ability to wash in my top loading machine but I’m scared to death I am going to muck it up and it is such gorgeous fleece! Eeek! I would definitely pick out the big chunks, and the pieces that have the little remnants should come out while carding. It’s tedious but worth it. Also, I do like to bag my fleece is lingerie bags no matter how I wash it because it minimizes the amount of handling. That can also help contain loose pieces of VM. Enjoy!!! Hi Leah, thanks bunches. Every smidge of confidence I can get right now helps me through the initial scary parts! No worries!! You might want to do a small batch at first–like 8 oz– just to see how the fleece responds..